Every summer has its sound. Up until now, with the release of their breezy self-titled LP, Cults have cornered that market. 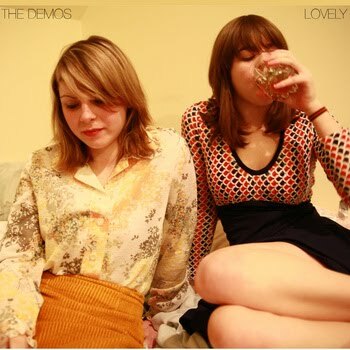 A challenger finally arrives on Lovely, the debut album from The Demos. With a poppy blend of Britpop and surf rock, the stylish Rochester duo glide through ten tracks of tasty bubblegum that somehow avoids the prophesied treacle usually associated with such endeavors. Are we in profound territory? Well, no- but Lovely never chooses to venture beyond its whip-smart aspirations. Like the best seasonal mixes, it’s hooky, genuinely memorable, and boasts an immense replay value. And for these reasons, it can safely make a solid case against Cults as to who rightly deserves the Sound of Summer title- the blatant irrelevancy of such a title not withstanding. The replay value comes from a strange place. The music feels familiar albeit fresh- a mellow mix of straightforward guitar riffs, catchy choruses, and string synths. We’ve heard all this before, but usually much, much worse. Many of the artists who influence The Demos are evident on Lovely. Yet the duo never panders to a particular genre, instead opting for a calculated palette of sounds and references. This allows the listener to reside in their comfort zone while simultaneously never finding the album predictable. Songs like “Meet at Night” and “Impossible”, dynamic homages briefly offering the source material a glimpse into newer places, are solid examples of this technique. While tunes such as "Nervous" are almost intimidating in yesteryear's uptempo catchiness. The Demos never stray far from these influences, with the end result being a dignified, reserved irony. If Mark McGrath possessed any integrity, Sugar Ray would have been more like The Demos- an efficient, undeniably fun band that doesn’t make the listener hate their self for participating. More often than not, the listener only wants to participate again.